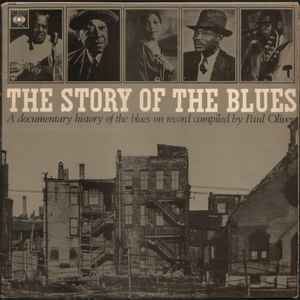 "A documentary history of the blues on record compiled by Paul Oliver"
Laminated gatefold, unlaminated (black text print only) inner spread. Printed & made by Ernest J. Day & Co. Ltd., London, W.11. Big Joe Williams ©Valerie Wilmer; Jimmy Yancey / Bessie Smith / Blind Boy Fuller ©Paul Oliver; Elmore James ©George Adins. Leadbelly ©Lawrence Cohn; Mississippi John Hurt ©Richard A. Waterman; Memphis Minnie ©Paul Oliver; Charley Patton ©Bernard Klatzko; Blind Lemon Jefferson ©John Steiner. (This release supports the eponymous book by Oliver, containing over 500 images to accompany the text: Originally published by Barrie and Rockliff, The Crescent Press). [Paperback cover in images].